अहाना (Ahaana) is a debut book of poems exclusively written by Jhimly Chakrabarty (Jolly) . The name itself suggests commencement of the new or the freshness in life. 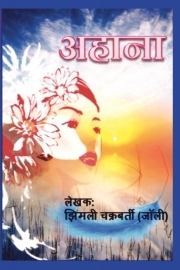 अहाना (Ahaana) explores various aspects of life and its varied emotions. It commemorates the essence and creative impulse of a person despite the hurdles that one comes across. Though the Poet belongs to a non-Hindi background. She tried to express her creative self in the best way possible and even language barrier could not constrain her. She tried to master the language, and express through her hard work and determination to learn more and better. But since poetry runs in her veins, so अहाना (Ahaana) evolved into a masterpiece of her expression.